If you would have asked me two years ago if I’d have a cheap, reliable 3D printer at home, I would have laughed. And yet, here I am, waiting for a print to finish. 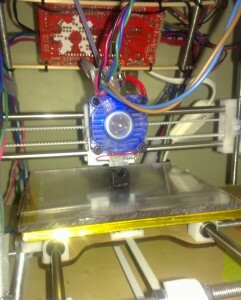 The printer in itself, a Huxley from eMaker (now RepRapPro), is a small miracle. Relatively cheap and reliable in operation. However, the big change is what you can create from home. Being able to create an exact piece of plastic from a CAD drawing has revolutionized my ability to produce machinery. It might be to create a replacement part for something at home, and adapter, or a corner piece for something (I make way too many corners these days). Having a 3D printer really lets the inner child out. Nothing is impossible anymore!